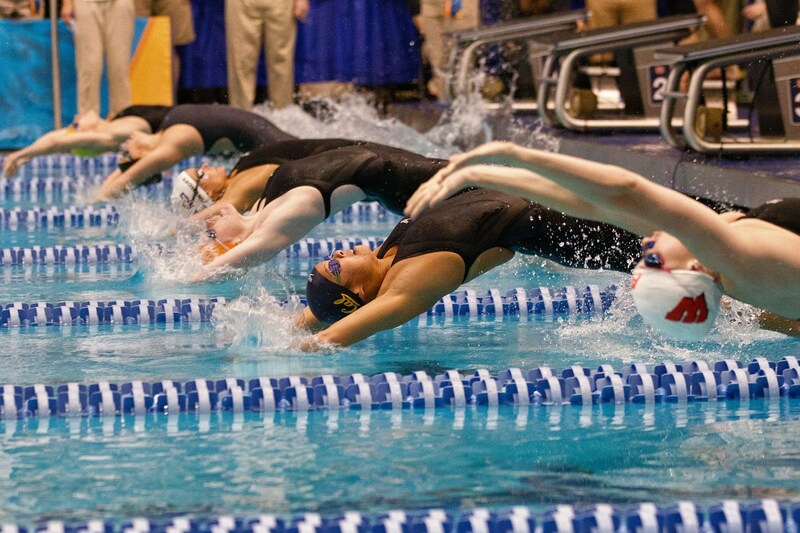 2013 Women's NCAA Championships: Where did these backstrokers come from? Tweet 2013 Women’s NCAA Championships: Where did these backstrokers come from? Anybody notice how fast backstroke events have gotten lately, especially on the women’s side? Why have we seen such a dramatic improvement in the overall depth of the backstroke fields at NCAA’s and other national/international level meets? There’s multiple factors, but looking at footage of races over the last few years will show you a combination of (1) swimmers going further underwater, and (2) swimmers carrying speed through and out of their underwater kick-outs better. Go back and watch high school and collegiate races from even a few years ago compared to now. While there have always been elite backstrokers with damaging underwaters on the female side (see: Natalie Coughlin), we are seeing a majority of the top men and women go further underwater off every wall in the short course pool (particularly in the 200 distance). Yikes. There have been no dramatic swimming innovations since 2007 (think flip turns, goggles, etc), and a 1:55.0 doesn’t even get you into the meet this year?!?! After it would have given you the third seed just 6 years ago?!?! Cal is absolutely loaded in this event, and will need big points to build momentum headed into day 3 this year to fend off their closest competitors (likely Georgia and A&M). Looking for their fourth NCAA team title in five years, the Bears boast the 1-2 punch of Cindy Tran (top seed and 2-time defending champion in this event) and Rachel Bootsma (2nd seed, true freshman, Olympic gold medalist, and former national high school record holder in this event). Both are known for utilizing incredible underwaters to put the field away early. But wait, there’s more! Cal also returns Stephanie Au (5th seed, finished 13th last year) and Melanie Klaren (10th seed, finished 12th last year). Cal should push three into the top 8 in this event, and don’t be shocked if you see four Lady Bears in the A-Final. Barring a severe breakout swim or a DQ, everyone not named “Cindy Tran” and “Rachel Bootsma” will be battling for third. There are five ladies between the 51.5 and 52.0 range: Paige Miller (Texas A&M junior), Felicia Lee (Stanford junior), Au (Cal junior), Brooklyn Snodgrass (Indiana freshman), and Sinead Russell (Florida freshman, Canadian Olympian). – Miller has continued to improve over her three seasons with the Aggies; she was 52.4 as a freshman, 51.8 as a sophomore, and is seeded at 51.5 this year. – Lee, the North Baltimore Aquatic Club native, has had an incredible season coming off of major shoulder surgery last summer, and is swimming the fastest and most confident she ever has. – Snodgrass had an incredible Big Ten Championships, winning both backstroke events and throwing down the fastest backstroke splits of the field. – Russell has also had a strong freshman campaign after semi-finaling in this event at the Olympics last summer, but this will be the second event in a tough day 2 double (she’s swimming the 200 freestyle just two events prior). A couple more swimmers to look out for: Dominique Bouchard, Sarah Denninghoff, and Lauren Smart. – Bouchard, a senior from Missouri, is better known as a 200 backstroker, but has developed more speed to match her incredible back half. – Denninghoff, now at Texas following her departure from Arizona, finished 4th in this event last year. – Smart was seeded third going into last year’s meet, but fell into the consol heat. If her times are any indication, it looks like she swam less rested during the season than years past. Anytime you’re the defending NCAA champion (where you won your event handily, by the way), and you’re coming of a two-medal performance at the Olympics, you should be favored to win again, right? Unfortunately for Elizabeth Beisel, American record holder Elizabeth Pelton happened to join the college ranks this season. Pelton, a freshman at Cal, is seeded more than two seconds ahead of the rest of the field, and is the favorite here heading into next weekend. A few other swimmers could challenge for the second spot, including Florida freshman teammate Sinead Russell, who joined Beisel in the final of this event last summer in London. Dominique Bouchard finished 3rd and 2nd in the last two seasons at NCAA’s over this distance, and will charge hard late on the field (two years ago, she was 8th at the 100 mark before bringing it home to touch 2nd). And then of course there’s Maya Dirado of Stanford, who was runner up in this event last season. Two other freshmen (Snodgrass of Indiana and Bonnie Brandon of Arizona) are also seeded under 1:52.0, and are within striking distance of a top three finish. Darkhorse: Isabella Aracilla, SMU. Also, look for Lily Moldenhauer from Texas. After two subpar NCAA meets, look for the Longhorns at NCAAs to have a better overall performance under first year coach Carol Capitani than in years past. Darkhorses: Three names… Ellen Williamson (Virginia, dropped a full second at 2012 NCAA’s to jump into top 8), Kelly Ryan (Notre Dame, dropped two full seconds to jump into top 8 last year), Brienne Ryan (Fordham, dropped two full seconds to jump all the way to 17th last year. She’s seeded 45th this year and could land in scoring position). Always like Cindy Tran even if she is weaker in meters than the other swimmers. Her family is real grateful to be in the US since I believe her father escaped labor camp in Cambodia since he was an ethnic chinese and Tran and Klaren comes also from Orange County as well.